This premium motocross goggle loses the hinged, quick release system of the Airbrakes, and saves some (just some) cash in the process. Since the Airbrake launch five or so years ago, Oakley has been pretty low-key in terms of new product. They made a big deal of their Prizm lens and was much less vocal about what we have here, the Front Line Goggle. 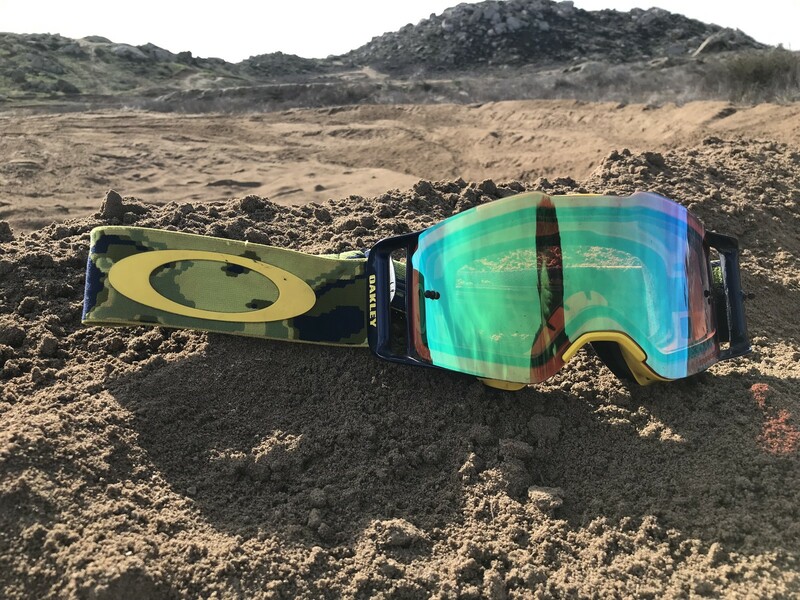 It is the latest in their line of high-impact goggles that have a rigid, pre-curved lens, following the Airbrake and Mayhem Pro, yet it has its own system of lens retention that is different than both of those models. I might be the first to say it but I don’t really like the look of the Oakley Airbrakes. The overall shape and rounded nose area makes the goggle look more like snow goggles to me. I know, it’s just personal taste, but the profile of the Front Line goggle is much better looking and is undoubtedly a motocross goggle shape. I ditched the nose protector right away since, no matter what helmet I wear, the nose cover always touches the top of the chin bar. The overall rigidity of the goggle is also different than most. A standard goggle with a flexible frame and flexible lens is very malleable and can be basically bent in half without issue. On the other hand the Airbrake has both a rigid frame and lens, and has no give whatsoever. The Front Line, however, finds a nice balance between them with a flexible frame and rigid lens. Obviously, the first thing you notice about goggles is the fit, and these fit my face great. They are wider than most goggles but not so wide that they have fitment issues in a helmet or take up the whole eyeport. Recently, I had been wearing SPY’s Foundation goggle which is massive and takes up nearly all of the eyeport, therefore has to be designed to get some airflow passed the top of the goggle. The Front Line seems to be a good size - a bit of airflow can still pass over the top and the sides without needing special designs to further facilitate this. I have a round face (not flat) and a smallish nose so I don’t typically have any goggle fitment issues. If anything I find some goggles put too much pressure on my nose and make it harder to breath. Both the Airbrake and Font Line have a similar fit thanks to the pre-curved lens that seems to distribute the pressure of the goggles more evenly across my face. I didn’t have an issue with the way the Airbrakes fit, but riders that have large noses, or pointy faces, or really flat faces could run into fitment issues because the curve of the frame and the lens might not match their face and there isn’t enough give to let the goggle mold to a different face shape. That’s pretty much the point of the Front Line. You get the impact protection from a thick, rigid lens but the frame of the goggle has more give to better mold to different kinds of faces. Lens removal is actually easier than I thought. The Airbrake’s locking mechanism is the easiest, but with the Front Line, it is easier to remove and install the lens than with standard goggles. There is a ridge on the inside of the lens that mates up with the front of the goggle and you slide the ridge into the goggle pretty much like you would a standard lens. But because it is rigid, it is way faster. Speaking of the lens, the Prizm lens is pretty fantastic. It filters out certain wavelengths of light to make colors more intense. It is like turning up the contrast on the world. This makes seeing the subtle differences in track conditions much easier. Is it necessary? No. But it is nice to have and I feel like I have less eye strain at the end of the day. The Jade Prism is not too dark but takes the edge off bright sunlight to let me focus on riding, rather than squinting to see where I’m going. If you think that a harder lens is more resistant to scratching, you’d be wrong. If anything, the Jade coating is even more susceptible to scratches and nicks than standard clear or tinted lenses. They aren’t the most fragile lenses I’ve worn but you do have to be careful or run tear-offs all the time. I never run tear-offs so I pay the price of small scratches and nicks but I’ve had these for about a year and I’m not even close to reaching for a new lens yet. Who is the Front Line goggle for? The price tag dictates that no matter your skill level, you better have some extra scratch laying around. We are pretty taken aback at how expensive goggles are getting. Just a few years ago, 100 bucks for a goggle was pretty ridiculous. Now it is standard. If you are an Oakley fan, want the protection that rigid lenses can provide, have the budget to swing it, and have an unique face shape that needs a soft frame to mold to it, then the Front Line is perfect for you. But, is this nearly $200 worth of goggle? I don’t know. They work great and other than some dings and nicks, I don’t have any complaints on the performance side. But there are pretty solid goggles for a quarter the price. Available with Prizm lens technology. Removable nose guard. Ridgelock lens technology. Rimless lens design. Triple-layer face foam. Flexible O Matter chassis.